Agram Arena Summer 2017 - 40K, XWing, Malifaux .. It is time for another (15th annual) Agram Arena Summer Tournament! 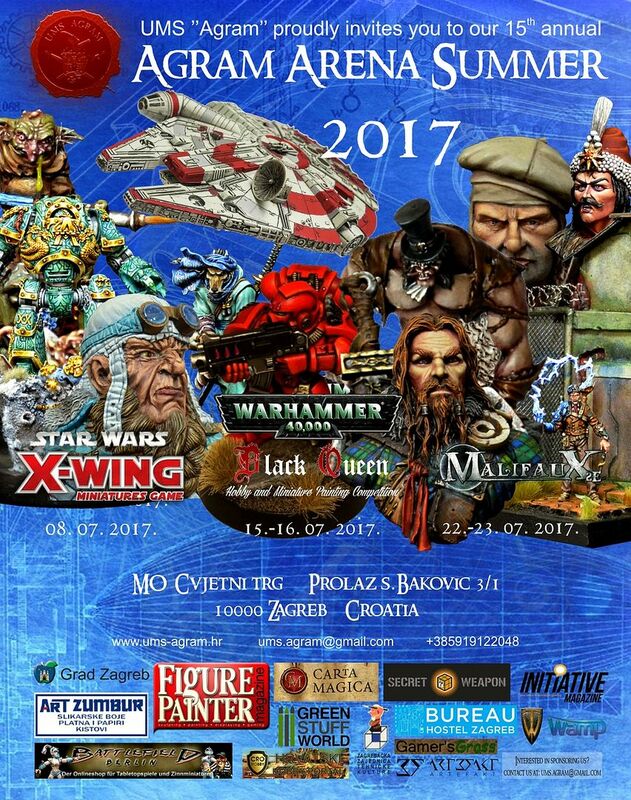 15-16.07.2017. International 40K Tournamenty + Hobby and miniature painting competition Black Queen! Accommodation for Saturday night is also free for the 1st-time-comers (read more in the rules)! Everyone else can be booked for the price of 13€ for the nights 8/9.7., 15/16.7 and 22/23.7, and 18€ for every other night you might need. The Hostel is in the centre of the city, with parking ensured and only 5 minutes walk from the venue. After the end of the registrations of each respective event (June 7th for X-Wing, June 14th for 40k and BQ and June 20th for Malifaux) it is no longer possible to cancel your accommodation and you will be billed for the accommodation at full price (18€ per night regardless of any discounts you might be elligable for). Also, the room assignements will be done once the registrations are final as we are not a tourist agency.